Spanglefish 2 has a much-improved admin system, with one of the key features being the separation of page-centric editing options and site-wide controls. Each is accessible through it's tab on the new Spanglefish 2 control panel visible across the top of your site when you are logged in. The Site Settings tab is the admin section which provides access to all sorts of configuration options for your site as a whole, as well as storing your account details. These include . . . 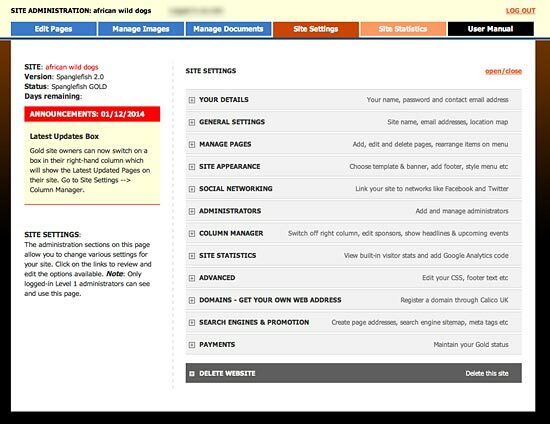 This panel on the left of the main Admin page displays details about your site, such as its name, status (whether FREE or GOLD), how many GOLD days are left before the £29.95 renewal fee is due, the version of the Spanglefish system that the site uses, a brief description of the admin controls, and any new system announcements. This is where you store and manage your personal details such as your name, contact email address and password. Spanglefish DOES NOT share your private information with anyone else - it's simply so we know who owns the site, and can contact them in the event of a lost password or when Spanglefish GOLD status renewal is due. GENERAL SETTINGS: Change your site name settings, site email addresses or site location. This is where you control the name of your site and add an email address to be used as the destination for your site's Email Contact form. You can also adjust your location map here, which is useful to your site users but can also improve your site's search engine ranking. This section also includes a field where you can add your paypal email address, so you can add a Paypal shop to your site and have it automatically add paypal 'buy' buttons for you. MANAGE PAGES: Add a page, move pages on your menu, change page visibility or delete a page. SITE APPEARANCE: Choose from our template library, change your banner or footer image, change your site layout, choose your menu type or pick menu colours, switch off the Spanglefish branding, or upload a personalised 'fav' icon. Another exciting addition to Spanglefish 2 is the new Template Library which lets you choose a new design template for your site and dramatically change how it looks at the click of a link or two. Additional controls let you change the colours of your menu buttons too. ADMINISTRATORS: Add or delete administrators. Your site may have several administrators who help maintain it. This section lets you add and manage new ones and allocate different levels of admin control. COLUMN MANAGER: Switch on/off right-hand column, edit sponsors, show news headlines or forthcoming events. SITE STATISTICS: View the built in site statistics or add Google Analytics. A simple no-nonsense traffic monitoring system showing sessions, page views and referrers. Alternatively, if you want to add Google Analytics code so you can monitor your visitors in exhaustive detail this section lets you add that code automatically to all of your site pages. ADVANCED: For the 'geeks': edit your CSS, or your footer text. If the new template, banner and menu colour options offered by Spanglefish 2 aren't enough for you, youcan get your hands good and dirty here and tinker with the underlying Cascading Style Sheets programing to make your site look just the way you want. DOMAINS: Register your own domain name. A web domain can help your site look more professional, and is very useful for small busineses in particular. This section lets you check domain availability and order one through our partners Calico UK. SEO & PROMOTION: Create unique page addresses, view your search engine XML sitemap. If you operate in a very competitive business sector then you may need to squeeze every search egnine ranking advantage out of your site. The features let you optimise your page names and sitemap to help this process. DELETE WEBSITE: Lets you ask to have your website deleted. Maybe your project is now finished, or it's simply outgrown Spanglefish (in which case see our parent company Plexus Media's bespoke website design service). If you want to close your site down then this section provides a form where you can request this.